26Th of May You can pre order your pre-cut kit today for only $25.00! More info to follow, but here are some pictures to get you excited! To attend the May 26Th workshop, you will need to have RSVP with PAYMENT by May 19Th, which can be done using the Paypal button below... Hope to see you there! This is my entry into this weeks MOJO Monday contest. I used CTMH's footloose paper pack, I cut 1x1 squares and varied the pattern. I inked the edges of the papers with CTMH bamboo. The stamp is from the Art Philosophy bundle. Thanks for looking! to spend part of the day creating... What will you be doing today? I made this beautiful card for the next Card Club! I used Autumn Terracotta paper for the pot, which comes in the DarkYellow & Orange Shade pack (X5915). 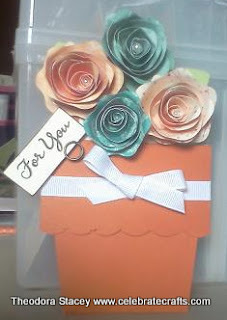 The flowers were cut using CTMH's Art Philosophy cricut cartridge (Z1686). The flowers were rolled and held in place using Liquid glass (Z679). The flowers were cut from the key to my heart paperpack as well as Stella (X7147B) The ribbon is old CTMH grosgrain white daisy, and the sentiment is from From me to you stamp set. Want to learn how to make this? This card would make a great addiditon to any gift for Mother's Day! The next card club is meeting April 21st. Want to shop for the items I used? Visit my shopping site! I got this idea from my friend Katt, who got it from Stephanie Luman.. thanks for sharing ladies! stock, ribbon or?? Check it out for some great deals! When it's gone, it's gone!! Click HERE to shop!